Supported by a dedicated and active online community, Drupal is one of the most popular open-source content management systems used online today. Millions of blogs, websites and enterprise-level applications have been built using Drupal and worldwide there are more than one million developers spread across the world that develop with it and for it. 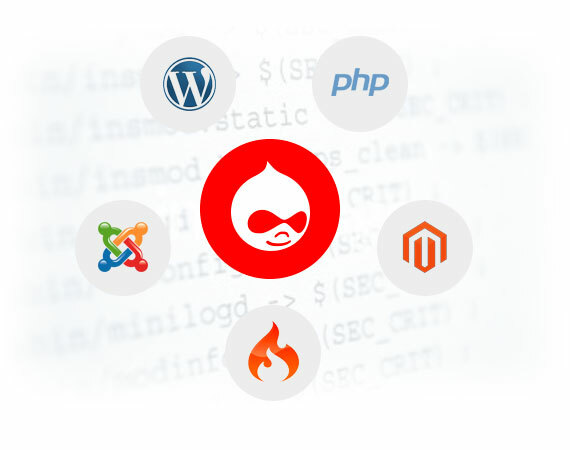 Planning To Use Drupal For Your Next Project?Get in touch with us! Our web development team has the experience and knowledge to create powerful Drupal applications that can transform the way you do business. With a clear focus on high-quality, high-performance products, our team is ready to meet and exceed your expectations and vision without compromising your budget. Enjoy many customizable features and a custom-designed website. We can create anything from a powerful eCommerce platform to a basic CMS. Using Drupal we can even create your own social media site for you. Access the wealth of experience and know-how of the thriving Drupal community. Thousands of developers across the world are developing new code for Drupal and our team can access this to deliver the best possible project for you. Drupal isn’t just powerful – it’s quick too. By writing your application in Drupal we severely limit the likelihood of concurrence or speed problems during everyday usage. We are experienced at providing enterprise-level content management systems using Drupal for companies across a range of major industries. Take advantage of a powerful interface, integration of bespoke modules and the ability to empower your staff to quickly and easily make changes that on other systems would require an IT professional. Take advantage of the power of Drupal with a bespoke eCommerce site. We can integrate a variety of powerful modules including tax plugins, inventory management, recurring payment management, shopping carts, order history reviews and many more. We can create beautiful and functional websites for the travel industry using Drupal. Sites will feature booking systems, a powerful content management system and any one of a number of bespoke modules to meet the specifications of your business. Drupal is the perfect platform for intranets, member sites, informational sites and even social media sites by taking advantage of the wide range of add-on modules available. Extensions: Social Plugins, Administration, Site building, Content, E-commerce, Performance, Publishing, SEO, Search and more.